THERE'S a bear in there and plenty of fun as well. 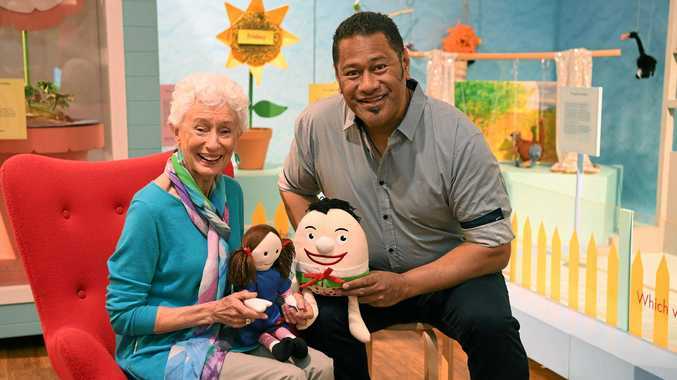 Presenters Benita Collings and Jay Laga'aia will join the Bundaberg Regional Art Gallery to open an exhibit celebrating household favourite Play School's 50th birthday today. The gallery will showcase memorabilia from the hit show including Jemima, Humpty, Big Ted and Little Ted as well as give families the opportunity to meet the stars they grew up watching at home. "The windows, the toys, it does bring back a lot of memories,” Ms Collings said. Mr Laga'aia said the day isn't just for kids, but the whole family, and was happy to get behind the people who helped him become a household name. "I'm one of those few people that when your name gets mentioned it's always with a smile. "You become the proverbial hand that rocks the cradle really,” he said. Community and cultural services Councillor Judy Peters said there was a lot of buzz around the gallery coming to town and that Play School was a great program for education during her daughters younger years. "It's an Australian show, it had Australian presenters and whilst children over the years have been learning by default, it was about fun and the presenters made it fun,” she said. The exhibit will be at the gallery until October 7.